It was ready to leave the dust, noise and disambiguated traffic of Kathmandu behind for seven days. We met in Thamel, a backpacker’s mecca decorated with hundreds of Tibetan prayer flags, souvenir shops and Israeli exiles garnished with meditation beads. A puzzle of streets and laneways, I had been living in Nepal for ten months and still lost my way in Thamel. The motorcycles were ready and waiting for us at the hotel. 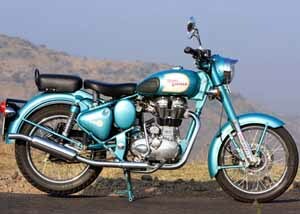 Three bikes stood majestically in the car park, The Royal Enfield Bullet with 500cc of street cred. 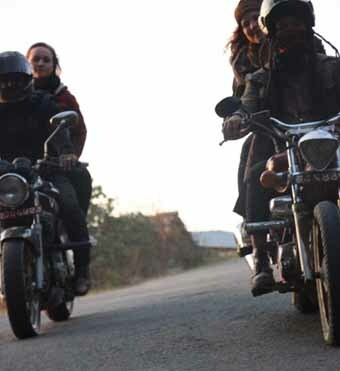 Built in neighboring India, Bullets were the motorcycle cult icons of the Himalayas. Kodari Road Nepal: We headed north to our first destination up the Kodari Road towards Tibet. A scenic 100km that took four hours of climbing hills, blinding bends, crossing suspension bridges, and stopping more than often for sweetly spruiked chai. We parked at the last Nepali campsite just 10km before crossing into Tibet, reconvening at the bar we ordered the Nepali trademark Everest Beer. We were back on the road mid next morning headed west via the temples of Kathmandu. Brothers Dinesh and Junesh were from Bhaktapur, a village still stuck in the medieval ages. Narrow cobbled alleyways leading to temples where goat and buffalo sacrificing still prevailed daily. Pashupatinath temple Nepal: We stopped into Pashupatinath Temple, Nepal’s largest Hindu temple dedicated to the Lord Shiva and the home of the most photographed sadhus in the world, also known as Babas. Babas are known as wandering monks who are respected religious men and have given up the material world, some have been rumored to still practice cannibalism. Junesh resembled a young baba, adorned with knee length dreadlocks wrapped Nefertiti style on his head – we named him Motorcycle Baba. Chitwan Nepal: Waving goodbye to Lord Shiva we headed west to the jungles of Chitwan, still rumoured to house the Royal Bengal Tiger. Dodging sacred cows and elephants our newly found road obstacles, we roared through the villages leading us into the jungle in search of our very own Richard Parker. As night fell we made our way to a local bar and lazed about on cushions like giant caterpillars smoking sheesha (flavoured tobacco) out of hookah pipes, elegantly unwinding from our second day on the road. The next day was hot and dry on our way to Lumbini heading toward the flat plains of the Indian border. We were off to see the tree that Buddha was born under, Nepal’s second national treasure. Riding back seat behind Dinesh, I convinced myself that I had reached a state of Nirvana, never minding the hot winds I eerily watched Nepal become a looking glass of India as we reached closer towards the borderlines. Lumbini Nepal: We arrived at Buddha’s birthplace, Tibetan prayer flags colored the tree like tinsel on an over excited Christmas tree. Schools of Buddhist children chanted their sweet mantras drifting me into an afternoon Zen as I lay complacently under the holy tree. We stayed overnight at Lumbini as tomorrow’s ride was the longest, a beautiful eight hour journey to the lake city of Pokhara. At daybreak we began our ascent to Pokhara, up mountains and down along the riverbanks, through primitive villages stopping at dingy eateries and sampling momo’s - a tasty steamed dumpling filled with buffalo meat. Arriving into Pokhara at dusk we made haste to the Bullet Bar, a new local drinking spot named in honour of our beloved bikes. We stayed two nights in Pokhara, a town more developed than the others to welcome the trekkers before and after their journey around the famous Annapurna Circuit. The main road lined with cafes, restaurants, bars and enough North Face clothing stores you could poke a Zen stick at. Our days together were over and it was time to return back to the daily grind of Kathmandu. Wistfully and silently we rode back to the city the next morning, back to our families, back to reality. Somehow, it was still good to be home. 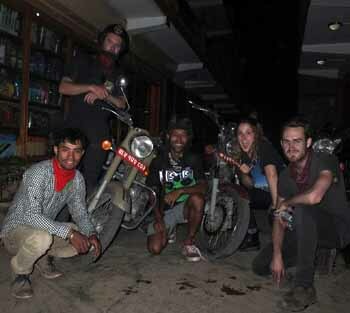 Junesh Twana is the founder of The Himalayan Motorcycle adventure and offers tours around Nepal. 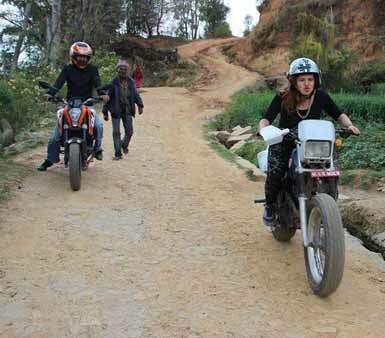 The 11-day Himalayan Motorcycle adventure is priced from $3,200.00 per person, land only. Visits Kathmandu, Nagarkot, the Royal Cities of Kathmandu Valley, Chitwan National Park, Pokhara and Lumbini. The 22-day Himalayan Motorcyle adventure+ Trek Option is priced from $4,000.00 per person, land only. Visits Kathmandu, Nargarkot, The Royal Cities of Kathmandu Valley, Chitwan National Park, Pokhara, Tatopani, Thorong Pedi, Yak Kharka, Manang, Pisang, Chame, Dharapani, Jomsom, Bahundanda and Besisahar.